In a small sauce pot, combine the quinoa and ½ cup lightly salted water. Bring to a boil, reduce to a simmer, cover, and cook until the quinoa is tender and the water is absorbed, 12 to 15 minutes. While the quinoa cooks, prepare the sweet potatoes. Scrub or peel the sweet potatoes. Trim the ends and cut the potatoes in half lengthwise, then cut each half lengthwise into ½-inch-wide wedges. On a sheet pan, toss the sweet potato wedges with 2 teaspoons oil and season with salt and pepper. Spread in an even layer and roast, stirring once halfway through, until tender and lightly browned, 20 to 25 minutes. While the sweet potatoes roast, make the burgers. Scrub or peel the carrot and trim off the end; grate the carrot. In a medium bowl, using a whisk or fork, blend the egg with the bread crumbs and burger spice blend. Add the beans and mash into a slightly chunky paste, then stir in the carrot, scallions, and quinoa. Season with salt and pepper. Using wet hands, form the mixture into two ½-inch-thick patties. In a large frying pan over medium heat, warm 2 tablespoons oil until hot but not smoking. Add the patties and cook until browned and crisp, 5 to 6 minutes per side. While the burgers cook, prepare the cucumber raita. Trim the ends from the cucumbers; thinly slice the cucumbers crosswise. In a small bowl, stir together the yogurt, cucumbers, and dill. Season to taste with salt and pepper. Toast the whole wheat buns in the oven until lightly crisped, 2 to 3 minutes. Transfer the buns, cut sides up, to individual plates. Spread half the cucumber raita on the bottom buns, then top with the quinoa burgers and the remaining cucumber raita; close the buns. Serve the sweet potato fries on the side. 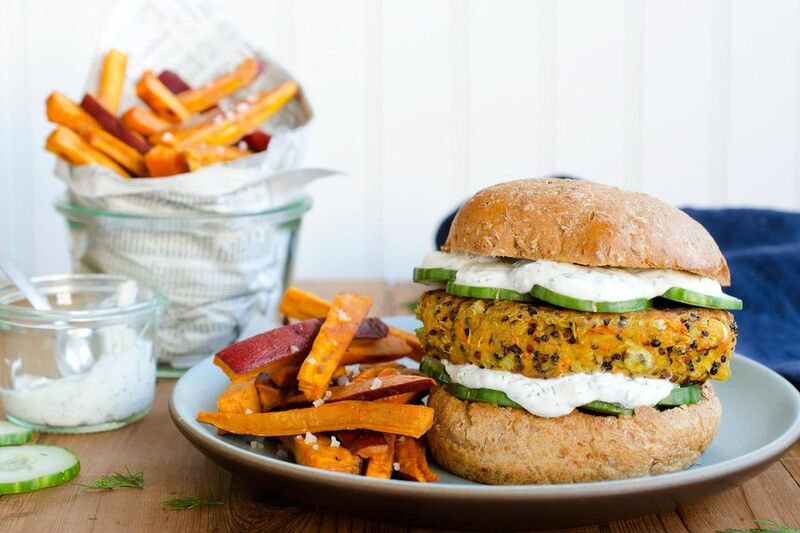 Stay home on burger night with these savory, high-protein patties and oven-roasted sweet potato fries. An herby yogurt sauce full of juicy cukes ties it all together. Calories: 760, Protein: 21g, Fiber: 21g, Total Fat: 25g, Monounsaturated Fat: 16g, Polyunsaturated Fat: 3.5g, Saturated Fat: 4g, Cholesterol: 80mg, Sodium: 610mg, Carbohydrates: 105g, Total Sugars: 15g, Added Sugars: 0g.